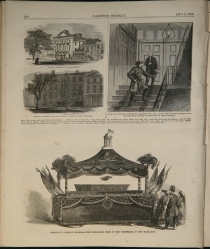 Engravings include: Lincoln and son Tad at home. 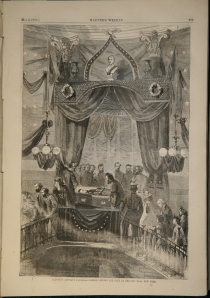 Scene at the death bed of President Lincoln. 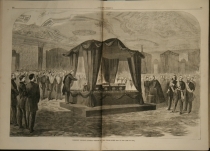 Funeral service at the White House. Ford’s Theatre. Attempted assassination of Secretary Seward. Citizens viewing the body at City Hall, New York. [ABRAHAM LINCOLN]. Newspaper. Harper’s Weekly, May 6, 1865. 16 pp., complete, disbound. Harper’s Weekly was founded by Fletcher Harper in 1857. It soon became one of the nation’s most influential papers, and its images are central to any visual interpretation of nineteenth-century America. 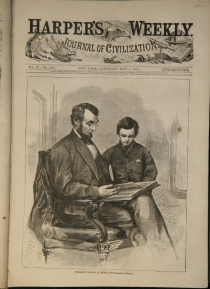 Printed in New York, Harper’s covered the key events of the day, including politics and elections, the Civil War, sports, literature and arts. Each issue has at least ten engravings, as well as political cartoons, editorial essays, “Humors of the Day,” and fascinating advertisements. Harper’s are printed on rag paper—different in weight and quality than the pulp paper used for today’s news. Thomas Nast, an early contributor, became Harper’s staff artist in 1862. During the Civil War, and through the 1880s, Nast’s images and reports were famous. His scathing cartoons brought an end to the notoriously corrupt New York “Tweed Ring” in 1872, and he created the Democratic Donkey, the Republican Elephant, and the modern image of Santa Claus. Winslow Homer contributed to Harper’s beginning in 1858. Homer’s The Sharpshooter is arguably the most famous Civil War image, illustrating the first war in which the technology of impersonal killing became truly effective. Homer contributed drawings to Harper’s until 1875. Reproductions of some issues are available online and in museum gift shops, but we sell only authentic original printings.